First Christian Church - SERMONS - Happy Labor Day! This is the Labor Day Weekend. Labor Day is a strange holiday to me. 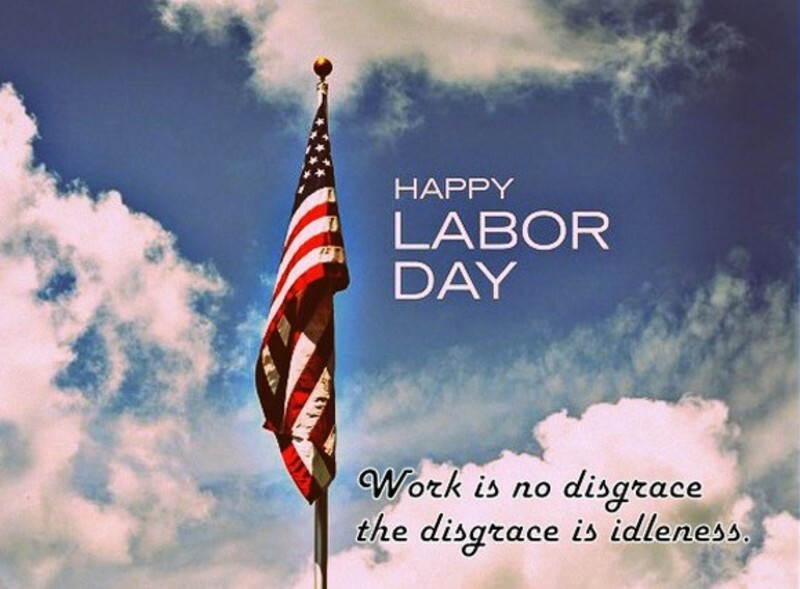 While we call it "Labor Day," we try to do as little labor as possible and most working people have the day off. Rarely does anyone say "Happy Labor Day". We don’t send Labor Day cards. We don’t decorate the house, or give gifts. The florists and greeting card manufacturers haven’t found a way to capitalize on this holiday yet. Labor Day is different things to different people. To the factory or office worker, it may be a day off. For policemen, who deal with extra traffic and alcohol abuse, it’s a tough day. To farmers and ranchers, it’s just another day to feed the cattle and work in the fields. For preachers, it is an opportunity to talk about work. So let me ask you a few questions, "Do you really like your job? How many of you look forward to going to work on Monday mornings because you really miss seeing your boss? How many of you miss your fellow workers so much that you can hardly wait to get back and see how they’re doing?" Now if you answered "Yes" to any of those questions, then you’re in the minority. Surveys reveal that 65% of American workers are unhappy with their jobs. Many of them go to work simply because they have no other choice. "I owe, I owe, so it’s off to work I go." Tennessee Ernie Ford sang, "You load 16 tons, and what do you get, another day older and deeper in debt." What drudgery! One reason our work is a drudgery is that we divide everything into secular and sacred categories. We say that over here is the secular, and over there is the sacred. And we spend the best hours of every day in the secular. We think, "I’d really like to serve God, but I have to spend so much time on my job." So we give God a few hours on Sunday morning. Maybe another hour on Wednesday night, and that’s it for many of us. But that is not God’s intent. He wants us to make everything sacred. Work is a very important part of God’s will for people. It is supposed to be a sacred thing. With this in mind, I want you to see three things this morning. But before I introduce my first point, I have true story for you today! The U.S.S. Astoria was the first U.S. cruiser ship to engage the Japanese during the Battle of Savo Island in World War II. It was a night action, fought August 8th and 9th in 1942. Although the Astoria scored two hits on the Imperial flagship Chokai, she was badly damaged and sank shortly after noon on August 9th. Before sinking, a young midwesterner, Signalman 3rd Class Elgin Staples, was thrown overboard by a blast when one of the Astoria’s eight-inch gun turrets exploded. Wounded in both legs by shrapnel and in semi-shock, Staples was kept afloat by a narrow life belt that he managed to activate with a simple trigger mechanism. More of that true story a little later! Point #1 God has always honored and provided work. God is a worker Himself and He appreciates rest. He created us in His image and gave us work to do and also a day of rest. Notice, it is six days of work and one day of rest—not the other way around. Even from the beginning, God gave man work to do. When Jesus came to earth, He was a working man. Jesus learned a trade as a carpenter. Jesus was known as a carpenter. He worked with His hands. They took offense at Jesus, because as a carpenter, they didn’t think he was qualified to be a preacher or teacher of the Word of God. He did not have a seminary degree. How can He know what the Scripture means? Undaunted by their criticism, Jesus chose working men as His closest disciples. Peter, Andrew, James, and John were fishermen. Jesus called them from their labors to become "fishers of men". What was Jesus saying to them? He didn’t want them going out begging from house to house. Jesus expected His disciples to earn their keep! So if God works and He wants us to work, why do so many people think of work as something bad? Because sin caused work to be unpleasant. Adam enjoyed tending the Garden of Eden until sin changed things. Therefore, we think work is a curse we have to endure. If we don’t have to work, we choose not to. Some people do as little as possible. They live off the labor of other people! That is sinful. How many of you had chores to do when you were a kid? Have you noticed that kids today won’t do chores? They expect things to be given to them for doing nothing! If they are told to do something, they whine, complain, rebel, and even refuse to do it! What’s worse, they get away with it! I would not have gotten away with that as a child. I don’t blame the kids today. I blame the parents! They are rewarding and teaching their kids to act that way. We are raising a generation that doesn’t know how to work. I thank God, that even though my parents didn’t often quote the Bible, they often enforced: 2 Thessalonians 3:10 For even when we were with you, we would give you this command: If anyone is not willing to work, let him not eat. There was no play time until the chores were done—and that included homework, too! And if the work was not done correctly, we had to do it over. It didn’t matter if we were missing our favorite TV show. By strictly holding to this principle, we learned to work, work quickly, and do it correctly. We also learned to work together and have a good time doing it. When work was finished, we enjoyed a good meal together—and we felt like eating. After the meal, we immediately washed the dishes—by hand—and dried them and put them away, too. Besides chores at home, we were encouraged to work outside the home to earn money. If we wanted something, we spent our own hard earned money to get it. This taught us to be frugal, to save, to delay satisfying desires, to be wise spenders, and the rewards for hard work. Every child can do chores and should be required to do them. Even toddlers can do simple things. It gives them a sense of worth and accomplishment. It makes them feel “big”, more like mommy or daddy. They learn responsibility and the praise for doing well and the consequences of failure. If parents don’t train their children to work, they are making them unemployable. No one want to hire a lazy, tardy person who only knows how to play video games. Their children don’t have anything to look forward to but a life on welfare. Oh! I almost forgot! Signalman Staples is still in the ocean! At around 6:00 that same morning, he was rescued by a passing destroyer and returned to the Astoria, whose captain was attempting to save the cruiser by beaching her. The effort failed, and Staples, still wearing the same life belt, found himself back in the water. More of that story later! Point #2. The corporate/labor union work system is not a Christian system, because "labor" and "management" are adversaries. Labor wants the most money for the least work. Management wants the most work for the least money. God has a better system. Ephesians 6:5-9 Bondservants, obey your earthly masters with fear and trembling, with a sincere heart, as you would Christ, not by the way of eye-service, as people-pleasers, but as bondservants of Christ, doing the will of God from the heart, rendering service with a good will as to the Lord and not to man, knowing that whatever good anyone does, this he will receive back from the Lord, whether he is a bondservant or is free. Masters, do the same to them, and stop your threatening, knowing that he, who is both their Master and yours, is in heaven, and that there is no partiality with him. Do those verses describe most work places? Slavery has been abolished, but many workers think they are treated like slaves! Many employers have attitudes like a slave master. They treat their employees like slaves. God doesn’t care if we are “labor” or “management”. He is no respecter of persons. He cares about how we conduct our business and how we treat others. We will all face judgment for what we do on the job, both employers and employees. The Christian cannot separate his work from his spiritual life. The Christian does not live and work for self alone. His earnings are to provide for his family and to help others. Back to seaman Staples. Close to 12 Noon, he was picked up again, this time by the U.S.S. President Jackson. He was one of 500 survivors of the battle who were evacuated to Noumea. Safely on board the ship, for the first time, Staples closely examined the life belt that had served him so well. It had been manufactured by Firestone Tire and Rubber Company of Akron, Ohio, and it bore a registration number. We’ll get to the rest of story momentarily! Point #3 The Christian does the best work he can for the glory of God. Colossians 3:22-24 Bondservants, obey in everything those who are your earthly masters, not by way of eye-service, as people-pleasers, but with sincerity of heart, fearing the Lord. Whatever you do, work heartily, as for the Lord and not for men, knowing that from the Lord you will receive the inheritance as your reward. You are serving the Lord Christ. Christian employees should do more than expected because they work for the Lord. Christian employers should do the best, not the least they can for their employees, because they also have a Master. People are more important than money. To be blessed, it is vital we treat people right. Listen again to Colossians 3:23-24 Whatever you do, work heartily, as for the Lord and not for men, knowing that from the Lord you will receive the inheritance as your reward. You are serving the Lord Christ. Notice, there are rewards for doing a good job! So back to our story. Given leave to go home, Navy seaman Staples told his story and asked his mother, who worked for Firestone, about the purpose of the number on the belt. She replied that the company insisted on personal responsibility for the war effort, and that the number was unique and assigned to only one inspector. Staples remembered everything about the lifebelt, and quoted the number. It was his mother’s personal code and affixed to every item she was responsible for approving. Now you know—the rest of the story. Do you suppose Mrs. Staples was glad that she had performed well on the job? It pays both in this life and the life to come to do our very best! We can’t claim to be Christians if our Christianity is only a one-day a week affair. God doesn’t want one day a week. He wants all of our life every moment of every day. Our faith should be reflected in our work, whether we are an employee or employer. How we carry our Christian principles into our work is important. Our work performance is our Christian witness and ministry. This should give your work a new meaning and dignity. Therefore, today, tomorrow, and every day, let’s be thankful for our jobs! Let’s be thankful for the health to do our work! Let’s do our work to the best of our abilities to glorify Jesus Christ! 1 Thessalonians 4:9-12 Now concerning brotherly love you have no need for anyone to write to you, for you yourselves have been taught by God to love one another, for that indeed is what you are doing to all the brothers throughout Macedonia. But we urge you, brothers, to do this more and more, and to aspire to live quietly, and to mind your own affairs, and to work with your hands, as we instructed you, so that you may walk properly before outsiders and be dependent on no one. If we’ll just settle down, build houses, get married, stay married, have children, go to work, and be the stable part of society, we will be the ones who have the message of hope, the message of Jesus Christ. You carry it in your heart this morning. So carry it to the workplace next Tuesday. Someone desperately needs to hear that message. I pray you can see your workplace as a sacred place, where you can serve the Lord, where you can witness your faith, to those who don’t know Jesus, by what you say and how well you do your work.